More than 200,000 people worldwide have cochlear implants and the number of newly implanted recipients is increasing dramatically each year. All recipients from the newly implanted to the long-term user could experience better hearing with Vanderbilt’s new programming process. Cochlear implants provide hearing restoration to people with severe-to-profound hearing loss. The devices use a combination of surgically implanted electrodes that stimulate auditory nerve pathways and an external sound processor worn behind the ear to provide hearing sensations. Although cochlear implants are considered standard-of-care treatment for severe-to-profound hearing loss, the quality of hearing is not on par with normal fidelity and a number of recipients may experience only marginal hearing restoration. 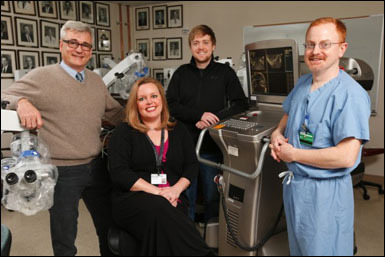 Vanderbilt’s interdisciplinary research team sought to improve those results by drawing on the work of students, professors and medical professionals from the Vanderbilt University School of Engineering, School of Medicine, Vanderbilt University Medical Center and Vanderbilt Bill Wilkerson Center. In addition to Dawant, the team included René H. Gifford, audiologist and assistant professor of hearing and speech sciences; Robert F. Labadie, associate professor of otolaryngology and associate professor of biomedical engineering; and Ph.D. student Jack H. Noble, now graduated and a research assistant professor in electrical engineering and computer science. Cochlear implants use from 12 to 22 electrodes, depending on the device manufacturer. Although the implanted electrodes can be seen on a CT scan, the nerve cells they stimulate are not easily identified due to their locations and microscopic size (on the order of one millionth of a meter). Traditionally, all the electrodes are turned on and programmed to stimulate any surrounding nerve cells. This one-size-fits-all approach can result in less-than-clear hearing when adjacent electrodes stimulate the same region of nerve cells. Complicating the challenge is that each person’s anatomical structure varies and thus every implant must be programmed—commonly termed as “mapped”—in a comprehensive, time-consuming process postoperatively. Vanderbilt’s research project included several stages. One was to determine a reliable method of locating spiral ganglion nerve cells (which connect to the auditory nerve) by mapping the corresponding external cochlear anatomy using a statistical shape model and to determine the position of the electrodes with respect to these nerve cells. Achieving this, the next step was to develop a technique that would use the information to generate a customized plan for postoperative cochlear implant programming that could be implemented by individual audiologists in almost any patient. The new automatic technique uses patients’ pre- and postoperative CT scans to determine the location of the implanted electrodes and where overlap is occurring, possibly causing interference in the transmission of signals. The image-guided strategy and software, which Noble developed as a Ph.D. student, then pinpoint which electrodes can be turned off without loss of hearing fidelity—and in fact, improving it. An audiologist uses this programming plan to create a revised custom map for that person’s needs. The process is completely noninvasive—no surgery is required—and can be accomplished in one office appointment. The project continues to enroll new study participants. Currently, they are recruiting adults, although Gifford, who is also director of pediatric audiology and audiology director of the cochlear implant program at Vanderbilt, said that she believes children in particular will benefit from the new programming because it can be mapped with or without responses from the patient. Learn more about cochlear implant research at Vanderbilt. Gifford said that if patients try the new mapping and don’t like the results, they can have their old programs put back on the implant. The research is supported by the National Institute of Health, National Institute on Deafness and Other Communication Disorders and National Center for Advancing Translational sciences (NIH/NIDCD R21DC012620, R01DC008408 and R01DC009404 grants and UL1TR000011 grant).